Alexandria, Real and Imagined offers a complex portrait of an extraordinary city, from its foundation in the fourth century BC up to the present day: a city notable for its history of ethnic diversity, for the legacies of its past imperial grandeur - Ottoman and Arab, Byzantine, Roman and Greek - and, not least, for the memorable images of 'Alexandria' constructed both by outsiders and by inhabitants of the city. 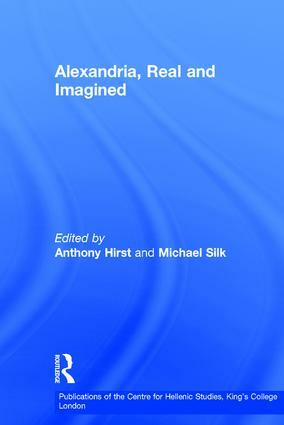 In this volume of new essays, Alexandria and its many images - the real and the imagined - are illuminated from a rich variety of perspectives. These range from art history to epidemiology, from social and cultural analysis to re-readings of Cavafy and Callimachus, from the impressions of foreign visitors to the evidence of police records, from the constructions of Alexandria in Durrell and Forster to those in the twentieth-century Arabic novel. Contents: Preface, Judith Herrin; Alexandria, the Mouseion and cultural identity, Herwig Maehler; Ptolemaic Alexandria and the Egyptian tradition, Sally-Ann Ashton; The face of Alexandria - the face of Africa?, Jessie Maritz; Mosaics of Alexandria, Anne-Marie Guimier-Sorbets; Roman Alexandria from the perspective of the papyri, Jane Rowlandson and Andrew Harker; Images of Alexandria in the writings of the Second Sophistic, M.B. Trapp; Life after death: an original form of bilingual iconography in the necropolis of Kawm al-Shuqafa, Anne-Marie Guimier-Sorbets and Mervat Seif El-Din; Jews and Christians in ancient Alexandria from the Ptolemies to Caracalla, James Carlton Paget; The Alexandria Library in history, Mosafa El-Abbadi; Venetian merchants and travellers in Alexandria, Giovanni Curatola; Merchants, pilgrims, naturalists: Alexandria through European eyes from the 14th to the 16th century, Anne Wolff; Environment, health and disease in Alexandria and the Nile Delta, George Contis; Alexandria 1860-1960: the cosmopolitan identity, Robert Mabro; For Cavafy, with love and squalor: some critical notes on the history and historiography of modern Alexandria, Khaled Fahmy; Towards a social history of modern Alexandria, Khaled Fahmy; Egyptian literary images of Alexandria, Azza Kararah; A passage through Alexandria: the city in the writing of Durrell and Forster, David Roessel; Cavafy’s Alexandrianism, David Ricks; Alexandrian poetry from Callimachus to Eliot, Michael Silk; Index. Dr Anthony Hirst is a Research Fellow at the Institute of Byzantine Studies, Queen's University, Belfast, UK and Michael Silk is a professor in the Department of Classics, King's College London, UK.